How Far Can They Really Go? The Oregon Ducks men’s basketball team has now won 20 games, which makes 2014-15 the fifth consecutive seasons of at least 20 wins. That has never happened in the 109 previous seasons of Oregon basketball. It’s astonishing to think about where the team was to start the season, and how quickly it has matured into a tournament-caliber squad. But despite their success, how legitimate of a threat are the Ducks going into postseason play? Several factors that will determine this. The first factor is how well the Ducks finish the regular season. I can’t even begin to stress how important it is for a team to finish well before the big challenges arise. If the team begins to lose its mojo as the season comes to a close, it’s nearly impossible to spark a fire and play cohesively again with so much at stake. Elgin Cook getting ready for battle. This especially is difficult with such a young squad. Yes, the Ducks are a top team in the Pac-12 and proved the haters wrong with their big win against Utah. But postseason play is something you can’t mentally prepare for until you’ve experienced it. That’s why many teams that end up playing well in the NCAA Tournament have solid veteran experience. 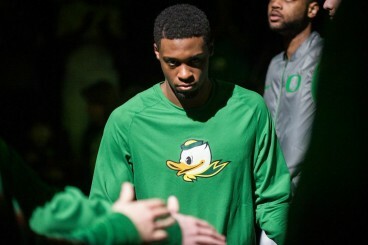 In the Ducks’ case, they really only have Elgin Cook and Joseph Young. That’s probably not enough to get them over the hump. Speaking of Joseph Young, despite being the catalyst for the Ducks’ success, he is the next factor that could inhibit a deep run in March. When your best player in gets locked up because the opponent knows he’s going to handle the ball the majority of the time, chances are he will get flustered. When every possession is magnified in postseason play, Oregon cannot afford to have Young force plays that could easily lead to opposing buckets. As great a player Young is, he’s not capable of leading this team on his own. That’s where the next factor ties in. Who’s the next man up after Young? We always talk about the next man up for our football team, and that usually works because our football team is as deep as the ocean. But what about our basketball team? Who’s the threat that will be able to take the load off Young and help the team navigate critical moments? I honestly don’t know. The team has played well as a whole throughout the season, but I credit Joseph Young’s distributing skills for most of that. It will be much harder for him to make the plays he has been making against bigger, stronger, and more difficult match-ups as the tournament progresses. Joe Young is they key for Oregon. The last factor here is Dana Altman’s coaching. I’ve never questioned his coaching abilities since I began covering the Ducks. Indeed, he’s done a marvelous job with this squad. However, Altman has never had to deal with such a young team potentially going to the NCAA tournament in his time at Oregon. How will he handle the rotation? How will he handle the practice workload? These are all unique variables that factor into postseason success. Some players might be worn out and need recovery time to perform well. But if Altman feels like they need more practice time, that could have detrimental consequences during games. With such a lack of depth off the bench, I’m very interested to see how Altman handles his player’s minutes, and how he will coach this particular team through the postseason madness. The season isn’t over yet, but with such great play as of late, and the promise of postseason play in the future, how can you not be excited for what is soon to come?